which causes problems for some people if ingested. So I didn't collect them. 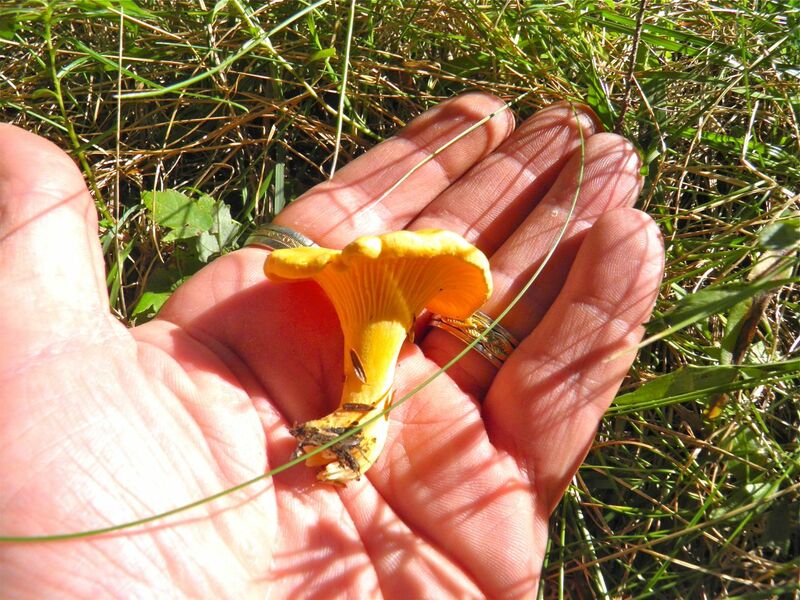 Remember: always be 100% certain that what you forage is completely correct. Also, only forage in areas that you know are unpolluted. If in any doubt about either of these two, leave what you find where it is. Last week I made a sojourn to the country. While I was there I made a point of making my way to the woods to see if I could find any identifiable mushrooms that could be foraged. I’m a chicken. I was 99% sure I found chanterelles but that 1% made me leave them where they were. There is a mushroom called “false chanterelle” in Nova Scotia. Although it isn’t actually deadly poisonous it can cause “discomfort” in some people’s digestive tracts. I didn’t feel up to the risk. So what was I to do? I remembered in years past that certain vendors in the old Halifax Farmer’s Market used to sell them about this time of year. If what I found was chanterelles it made perfect sense someone would have them there for sale. The new Seaport Farmer’s Market, although a marvel of locally produced food, didn’t yield a one. So I went back to the old original Farmer’s Market with little hope. Lo and behold, just inside the lower door there they were. Tons of them. I quickly picked up 1 lb of the golden treasures. Use a small bristle brush to remove the dirt from mushrooms. Cleaning them under running water isn't nearly as good a method. It’s always helpful to let the vendor know what you plan on doing with what you buy. They know their products. I wanted to preserve them, and already knew how to dry them. She volunteered another different method entirely – freezing. So I picked up another 1/2 lb and decided to try both methods. Home dried chanterelles are the same as the product you pay about $4/100g for in the grocery. 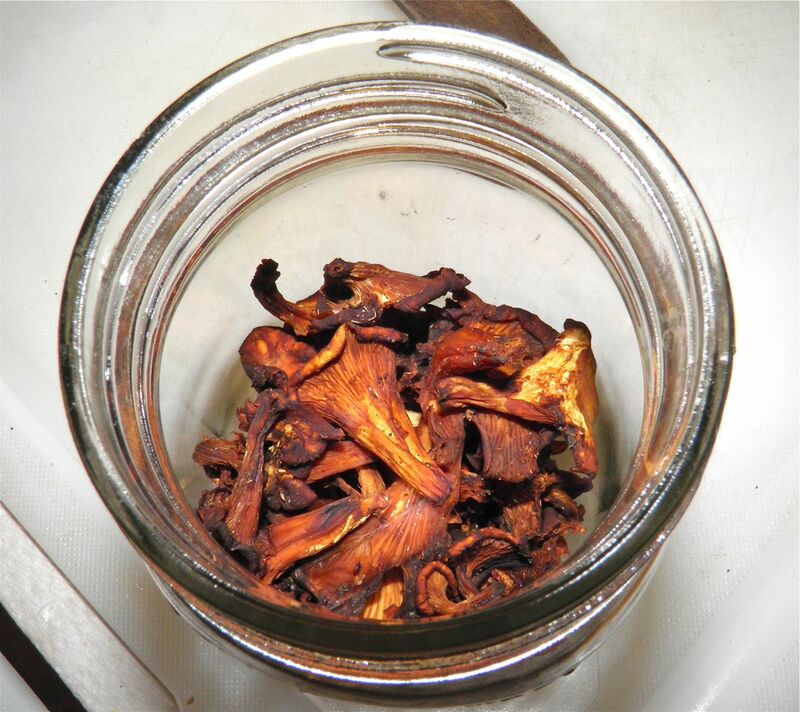 I dried 750g for $7.50. Of course they weight much less dried… but I got a lot. The second method requires sautéing briefly and them freezing. The upside is that they retain their structure and colour. 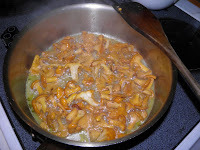 We’ll see how they perform in my Garlic Chanterelles in Phyllo Crowns… I will post that later. I need company for dinner to warrant making that one. It's very rich. 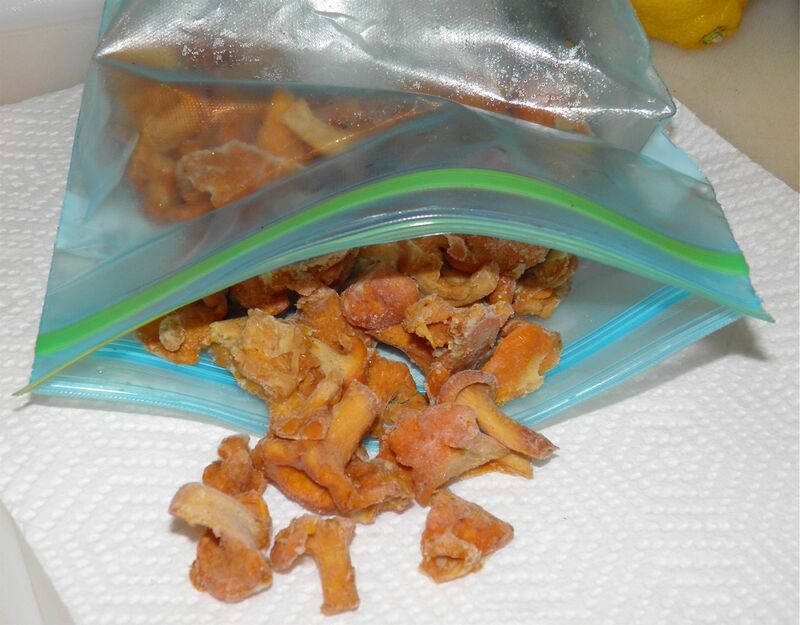 I hope that you try these methods for preserving mushrooms. 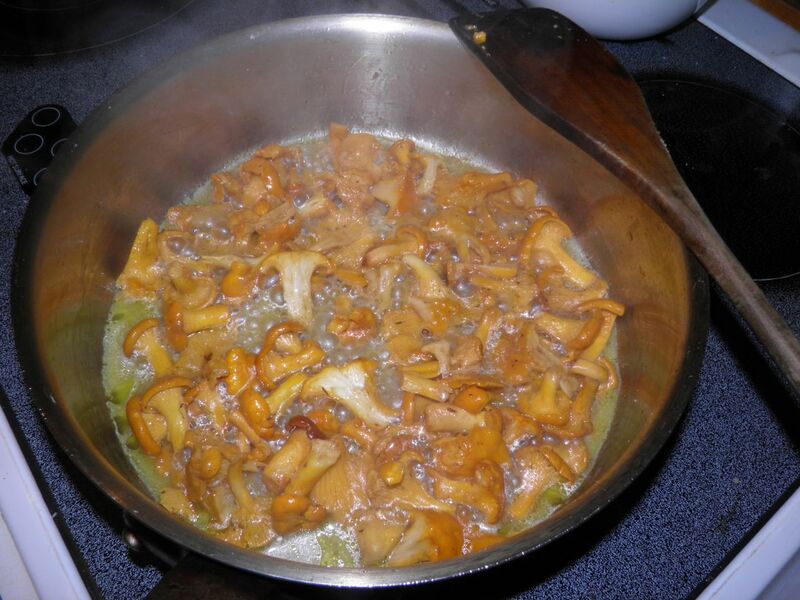 Although these recipes call for chanterelles they can be made with any mushrooms, even white. (Pete's Frootique usually has fresh shiitakes...) Any time you find a gourmet fungus for a good price grab it, and save it for later! Clean the chanterelles with the pastry brush taking care to remove any needles or dirt from the forest floor. Trim the ends if necessary. You can do both methods if desired or all one. To show each method I divided my chanterelles in two and did both freezing and drying. 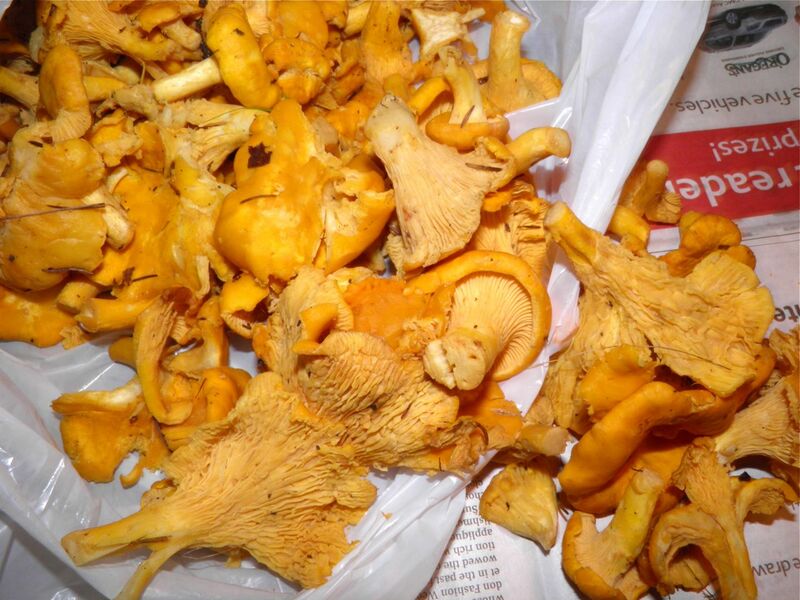 If you’re going to the trouble of drying or freezing you may as well purchase a fair amount of chanterelles to make it worth your while. Clean the mushrooms with a soft brush – NOT water wash.
Take a wire rack and place in a jelly roll pan. 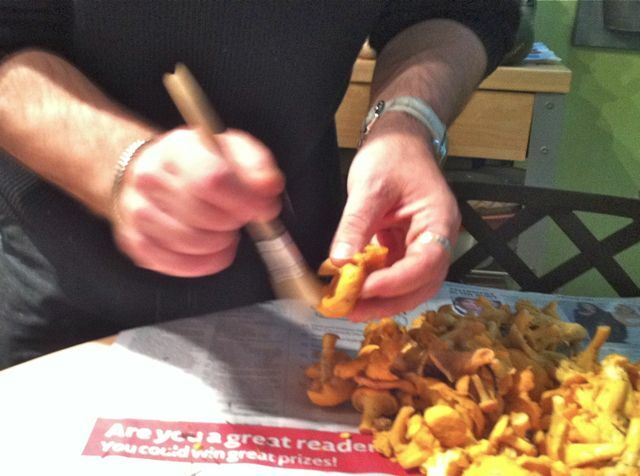 Arrange the chanterelles on the rack ensuring there is breathing area around each mushroom. If there are any larger pieces cut or tear them apart so no flesh overlaps on itself. Preheat your oven to 160°F. If you have a convection function use it. Place the mushrooms in the centre of the oven and allow to slowly dry. This will take about 7-8 hours. Slow drying preserves the colour better than higher heat. They will still get quite dark. After drying the mushrooms will feel leathery and there will be no moisture in the larger mushrooms when they are cut. To ensure they are dry, let the mushrooms cool completely and place in a Mason jar. Leave the jar on the counter for 24-48 hours. If any condensation forms, they are not completely dry. Re-dry in the oven for a few more hours. You can then bag the mushrooms and store in your cupboard. To use, reconstitute in hot water for 20 minutes. When you do, don’t throw out the mushroom water if you have a use for it. It's wonderful. The end result after 8 hours at 160°F. I can't wait to use them! Pour some olive oil in a large sauté pan. When the oil is heated sauté the mushrooms for about 2-3 minutes to set the colour. While they cook, sprinkle with a little salt to draw out some moisture. You are NOT cooking them through. Note: Reserve the olive oil and mushroom liquid that is left in the pan. Use it as a start to fry chicken pieces, pork or beef. The leftover infused oil is too important to just throw out! I used it to brown a pork sirloin roast before braising it. when mushrooms are sautéed and frozen. 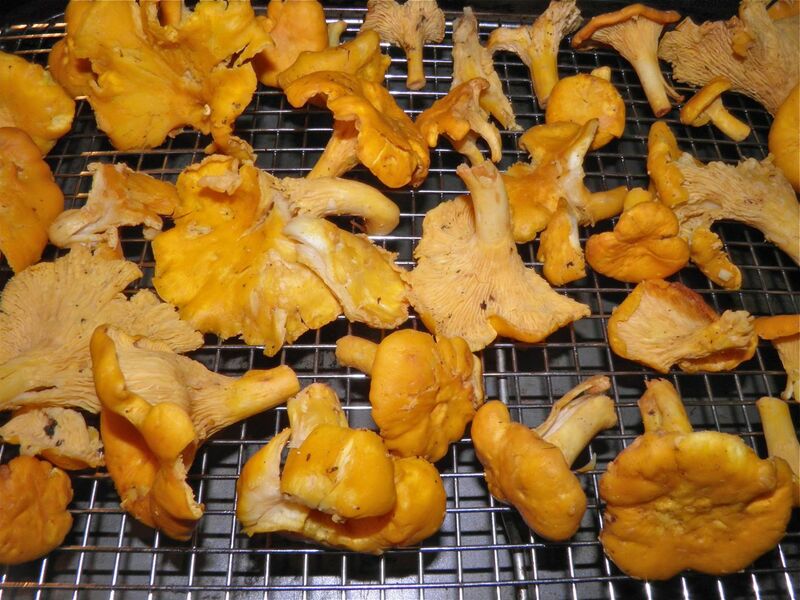 With a slotted spoon scoop out the chanterelles and arrange on a freezer-safe tray. Arrange the mushrooms in one layer. Let freeze for a couple hours and then break apart into individual mushrooms. This allows you to only take out the quantity you need at a later date. Place in a freezer bag. The frozen mushrooms will last for about six months. also use a bar fridge with racks in place. open door place mushrooms on racks, and place a dehumidifier in front of the opening. Block the open space , and presto....next day you will see results. day two they will be very close. This is far better method for drying.